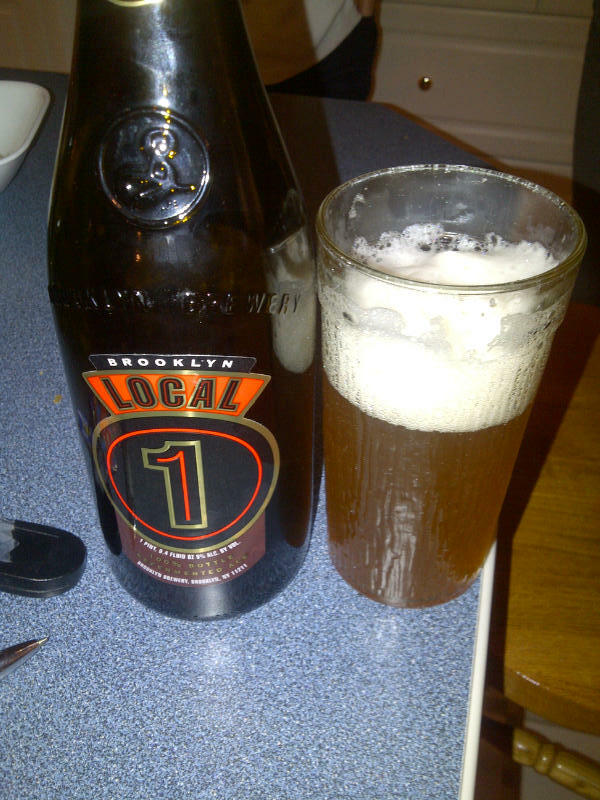 From Brooklyn New York’s Brooklyn Brewing comes the “Brooklyn Local 1″ a Belgian style strong ale. The beer pours a cloudy straw colour with an off white head. The aroma consists of sweet wheat, mild pepper and Belgian yeast. The flavour is of sweet citrus, mild pepper, sugar, Belgian yeast and some mild hops. This brew reminded me alot of a saison. The alcohol content is 9% and the IBU is 26. This is a very nice tasting brew even if it tastes of a different style to me. Commercial Description: In Williamsburg, Brooklyn, we forge barley malt and hops from Germany, aromatic raw sugar from Mauritius and yeast from Belgium into our latest beer, Brooklyn Local 1. Behind the full golden color you’ll find an alluring aroma, a dynamic complex of flavors, Belgian flair, Brooklyn fortitude and a dusting of our special yeast. To create this beer, we use the old technique of 100% bottle re-fermentation, a practice now rare even in Europe. It gives this beer a palate of unusual depth. Enjoy it locally or globally, as an aperitif or with your favorite dishes. Food pairing as per the brewery: This elegant ale fits nicely with seafood pastas, salmon, shrimp and ham. Thai food is a great match too. Triple crème cheeses love this beer, too. This entry was posted in Belgian Strong Ale, Imperial and tagged @beerzarre, @BrooklynBrewery, beer, belgian strong ale, belgian style strong ale, belgian yeast, brooklyn, brooklyn brewery, citrus, hops, hopy, mild hops, new york, pepper, sugar, sweet, sweet citrus, usa, yeast.